Bob Hawley has been in the Fire and Ambulance Industry for over 4 decades.For 10 years he was the Oklahoma EMS Training Coordinator in Oklahoma City. He has been a licensed medic for 36 years and serves in the National Registery of EMT’s. 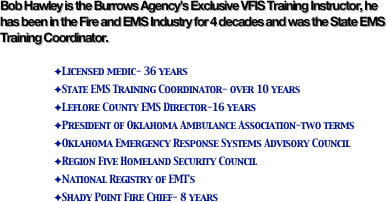 Bob was a member of the Oklahoma Emergency Response Systems Advisory Council, Regional Five Homeland Security Council, and also President of the Oklahoma Ambulance Association for two terms. Bob has since retired from his position at Leflore County EMS where he was the Director for 16 years. Although he is still the current Fire Chief of Shady Point in Leflore County and has been the last 9 years. With Bob’s long history in Oklahoma Emergency Services Community we were glad to announce him as our Oklahoma VFIS Trainer in 2010. Bob can teach instructor or student level courses for any of the VFIS Educational Courses. We send Bob all over the state of Oklahoma to teach our insured’s and also non-insureds how to be the best Emergency Services Organization they can be! Please fill out our Training Sign Up Form page or call us at (918)341-2196 for training. We are here to help answer questions about Oklahoma Volunteer Fire Insurance questions.